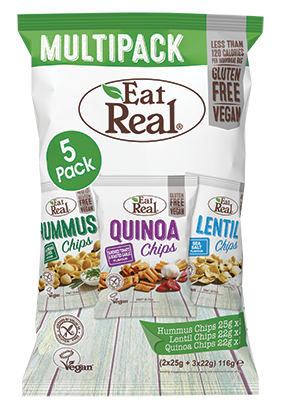 Sea Salt Lentil Chips: Lentil Flour (40%), Potato Starch, Corn Starch, Rapeseed Oil, Sea Salt. Sundried Tomato & Roasted Garlic Quinoa Chips: Quinoa Flour (29%), Corn Flour, Rice Flour, Corn Starch, Lentil Flour, Pea Flour, Rapeseed Oil, Sundried Tomato & Roasted Garlic Flavour Seasoning (7%) (Sugar, Tomato Powder, Rice Flour, Roasted Garlic Powder, Salt, Garlic Powder, Carob Flour, Natural Flavouring, Herb (Oregano), Spice (Cayenne Pepper), Colour (Paprika Extract), Onion Juice Concentrate, Sundried Tomato Blend (Sundried Tomato Powder, Rice Flour, Salt, Natural Flavouring, Colour (Paprika Extract)), Rosemary Extract), Sugar, Salt. Sour Creme & Chive Hummus Chips: Chickpea Flour (24%), Rice, Potato Starch, Rapeseed Oil, Corn Flour, Sour Cream & Chive Seasoning (7%) (Rice Flour, Onion Powder, Sugar, Salt, Yeast Extract Powder, Natural Flavouring, Garlic Powder, Herb (Chive), Citric Acid), Salt.